Jesus alone gives us all the new loving perspective of the escape from the grips of death. “If anyone wishes to come after me, he must deny himself and take up his cross daily and follow me.” (Lk 9:23). In this world, the reasons we hate are vast. So vast you can’t count them. No matter the circumstances, reason or justification from any soul, the reason to Love is greater. As Love has conquered the many reasons to hate. The life of St. John of the Cross, was full of many reasons for him to hate. But he choose to love instead. For all the reasons in the world to hate and despise can never match the one reason we Love. I never knew until today how much I can identify with this wonderful Doctor of the Church. I sit here and ponder and contemplate everything. I have been doing this most of my life and never understood the reason why I can’t become angry anymore about the sufferings I have gone through and still go through every second in exile, until I received that wonderful grace today at Holy Mass in honor of St. John of the Cross. What good can come from anything other than Love? 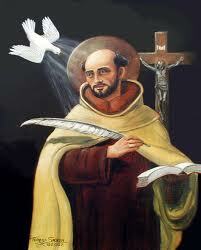 Thank you, on your feast day, St. John of the Cross, for prayers answered. I hold my cross with Love to give all the glory and honor to our Lord. I carry it in Love. There is no other way to hold it or to carry it. In my conversion back home to Him, I remember my childhood. Innocence. What I heard in the “Beginning” of my life. Jesus Christ is God. On the path to adulthood this “Truth” was compromised by the evil that sought my soul through lack of faith, lack of practicing my faith and through all sources away from the Truth. I remember a time when He, our Lord, came first. Christmas Eve as a three or four-year old, I was so excited that I would be receiving gifts but had so much love for our Lord that took over my soul, I needed to find something to give back to our Lord. I wondered so much what He would receive from me for His birthday. My presence didn’t mean much. The present I could give to Him ment so much more. I looked around the house and found two pieces of candy. I didn’t take into account He being an infant couldn’t eat it. I just knew I had to give Him something. How could we be celebrating His birthday and yet give Him nothing. I didn’t have any wrapping paper nor anything to place the candy in to present to Him. I took a paper towel roll and put the candy inside. I bent both ends down and wrote His name on it and placed it on the table. I thought about the Holy Family so much that night and who they would be with Santa Clause and I KNEW He would take what I had given to Him. Time came and presents were packed under the tree. I didn’t care about the presents. All I wanted to see was the present to our Lord was gone. It was still there, on the table where I placed it. I thought it wasn’t accepted. My heart was broken. Our Lord did not refuse that candy I gave Him, although it was still on the table. He took what it represented, all I had to give at the time and by my heart breaking, never left my side and gave me something much greater than anyone else could. He gave me faith in Him. He gave me joy in the midst of the destruction of self. He gave me everything I could need to make it through life in exile. Love. It wasn’t about the physical candy that I offered to Him, it was the love I had in my heart to offer all I had to Him. ALthough I lost sight of that, He didn’t. And that is what makes Him God. No matter how bad we mess up or pull away from Him, He allows us to understand He is with us FOREVER. The reason the present was still there is because what we place on His table, is always accepted in faith, without any physical need of the candy. The candy does not bring Him anything. We do by our simple faith and love in Him. St. Gregory Nazianzen, pray for us.